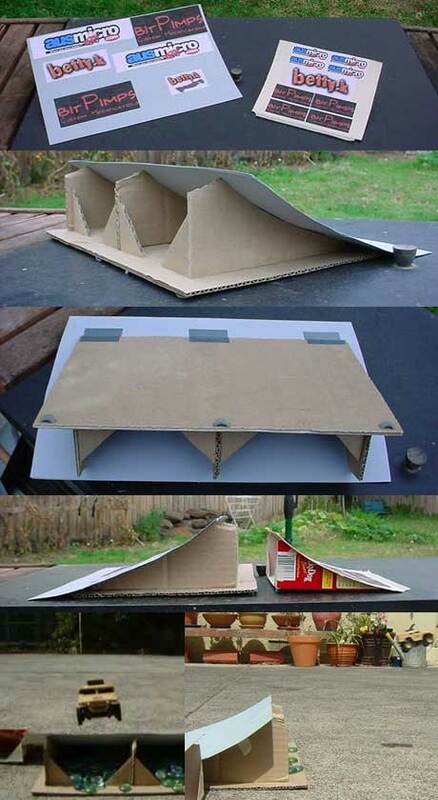 Here are a couple of pics of a jump ramp I made recently. 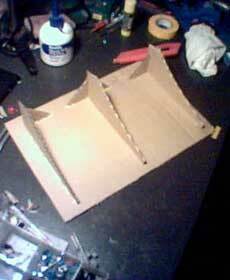 The base is made of corrugated cardboard and it’s all held together with pva glue. I’ve added a couple of supports to stiffen it up, but it’s probably not necessary. For the top I used some thin cardboard and I put some foam rubber pads on the rear underneath to stop it slipping. Craploads of cheap fun!! And here’s some of the fun just waiting for you when you’re done! You’ll find more jump action pics in my ramp action gallery. This entry was posted on Saturday, May 29th, 2004 at 4:13 pm	and is filed under Fabrication, Micro. You can follow any responses to this entry through the RSS 2.0 feed. You can leave a response, or trackback from your own site.